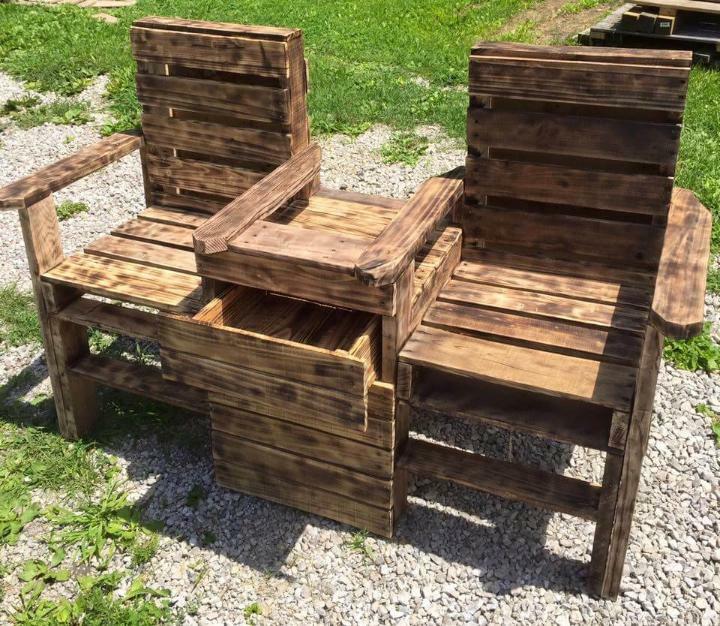 Pallet-made furniture and products are going through recycling trends and people really look deeply addicted to them! In this age of inflation, everybody wants to save a lot of money and pallet wood can really make it happen to you! By building indoor and outdoor friendly furniture with pallets, one can really have lots of costs saved and can trim down his furniture expenditures with big margin! 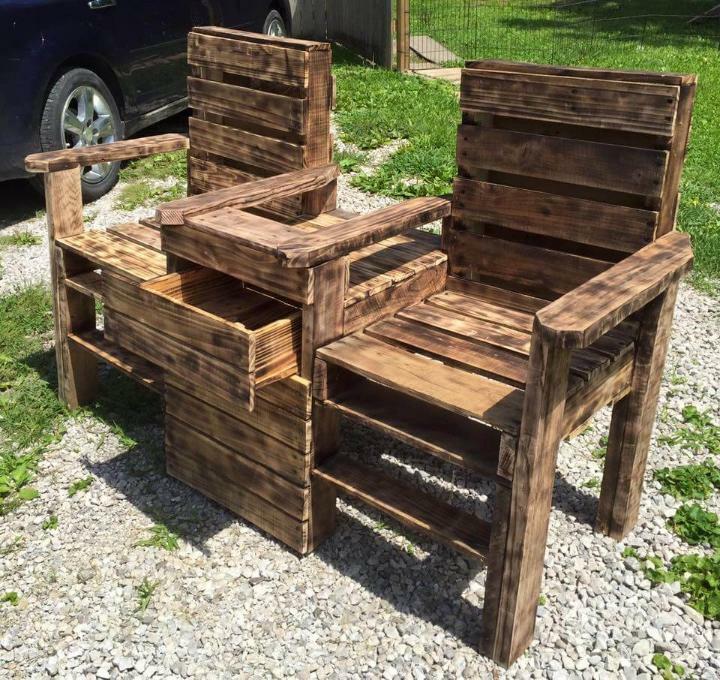 How much you can achieve with pallets and in what creative ways, we’ll elaborate it through this example of DIY pallet double chair bench, a perfect design of bench to bring style and cozy sitting place to your patio, garden, poolside, home deck and to paved outdoors! Construction is the same as building a chair out of pallets but you have to do it twice in this case! Mid side works great as a side table and you don’t need an extra one to put next to it, there is also a drawer fitted inside to hide your personal stuff like mobile phones, tools and wallets! See here that how a combination of 2 chair rocks as a bench! Whole layout has been achieved though recycling of pallets and there is nothing major to do while constructing it! Built it like the same as making a chair from pallets! Start it over by taking measurements as both the chairs should look like a clone as it is demand for whole beauty of the bench! Dismantle the pallets and create panels according the measurements, build the backrests, armrests and legs and assemble all using the hardware like nails, screws, metal plates and bolts! Don’t forget to add the mid section which is really a playful and fun setup for seated person and serve the user as a side table! Wood has been scorched by burning wood process for an antique and unique look! One can also finish it with stain, varnish and wooden sealant and also with paint to match the targeted space decors! 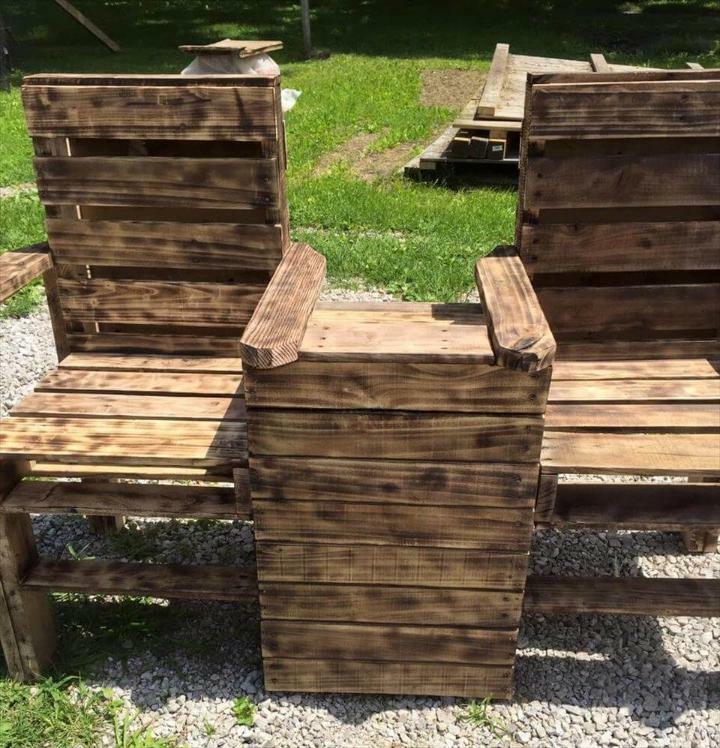 Wood Pallet Outdoor Bench - Double Chair!